Slab City is likely not a destination you're familiar with in California. If you're looking for a great, off-the-beaten-path roadside attraction, though, it should definitely be on your radar. Slab City is located in Imperial County, just over 150 miles northeast of San Diego. It's not actually a city at all. Slab City lies in the Sonoran Desert and is part of the California Badlands. Every winter, several thousand campers hang out here before heading north to cooler weather. During the summer months, temperatures can reach up to 120 F. It's said that a dedicated group of around 150 residents tough out the harsh conditions year-round. Don't expect to find five-star accommodations here as most people here are considered "squatters," seeing how there is no electricity or other services. Often referred to as "slabbers," they may derive their living from government programs or retirement funds, or they moved here because they are poor. Slab City gets its name from the concrete slabs left behind from the abandoned World War II Marine Corps barracks of Camp Dunlap. Camp Dunlap was opened in 1942 and by 1949, it housed just a skeleton crew. By 1956, it had been completely dismantled, with only the concrete slabs remaining. The land was deeded to the State of California in 1961 by the Department of Defense as it was determined that the land was no longer needed. There were no restrictions or restoration provisions noted. 1965 saw the first campers move into the region after they were ordered to leave a site near Mecca at Painted Canyon. 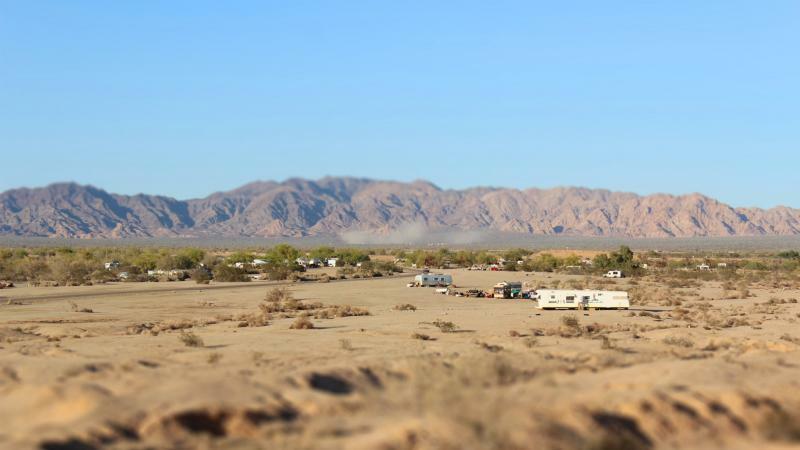 Some moved on to Bombay Beach while others came to what is now referred to as Slab City. The "housing" types vary-everything from trailers to cardboard and plywood shacks to school buses and other vehicles. Today, most people know the interesting 650-acre spot as the last free place in America, and it's what brings tourists to the area. However, free comes with a price in theory. You won't find electricity, water, or sewage pickup. With a lack of garbage pickup as well, you will notice there is trash pretty well everywhere. Aside from the interesting cement slabs and few hundred residents, you'll find a church and even an 18-hole golf course, which has no grass-it's in a desert, after all. There is the Lizard Library, where campers and residents can borrow, donate, or trade books and magazines. Want to dance the night away? There is a "nightclub" called The Range, which was set up by a local resident. Technically, it's just a stage between two old buses, but it has seats from old cars, buses, and theaters. Look for open mic night and other scheduled entertainment. There is also a hostel of sorts, the Slab City Hostel, founded by an international traveler who wanted that hostel vibe with lots of interesting people from all over the globe. And if you hit the timing just right, you might even be in town for the annual Slab City prom, complete with a new prom king and queen. There are several attractions of note in and around Slab City. These include the following. Salvation Mountain: Located just east of California State Route 111, the entrance to Slab City is marked by the colorful Salvation Mountain. It's a hill that stands 50 feet high and 150 feet wide and is covered entirely in acrylic paint, concrete, and adobe, adorned with bible verses. Salvation Mountain was created by Leonard Knight, probably one of the most famous residents here. 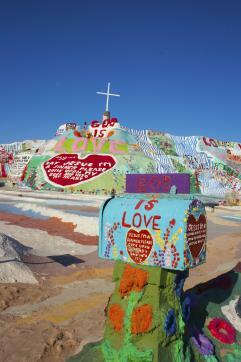 For over 20 years, Knight lived out of his truck, continually working on Salvation Mountain. Due to failing health, he no longer lives there. 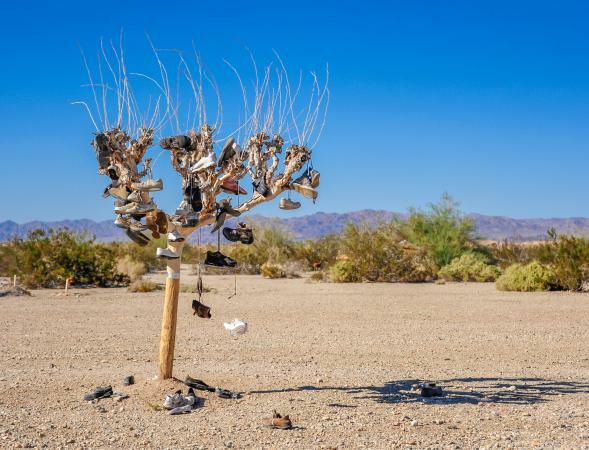 East Jesus: Located in the Slab City area, East Jesus is termed a "sustainable and habitable art installation." Despite its name, there is no religious connotation; it's more of a colloquial term for a place in the middle of absolutely nowhere. It's made with discarded materials and was created by Charlie Russell, who came to work alongside Knight. He was interested in the idea of "The Last Free Place." This rather interesting creation houses administrative, operations, and hospitality features, including a musical performance space that even has a grand piano, PA, and stage lighting system. The Kinetoscope: A circular mural found inside an abandoned water tank, the Kinetoscope was created by Christina Angelina and Ease One. Each of the female faces gives the appearance of being frozen in time yet also creating a sense of motion. Each face has a specific emotion which is meaningful to Angelina. Ease One provided a mix of Eastern and Western ghost writing, with hidden words that form Society lyrics, from Jerry Hannan and Eddie Vedder. If you're looking for other attractions nearby to combine in a visit, don't miss the following. Niland: If you're looking for provisions near Slab City, you'll want to stop in Niland, California. Niland receives a lot of business from Slab City snowbirds when winter arrives. Salton Sea Mud Volcanoes: The Salton Sea is one of the more unique spots in California and is certainly worth a visit if you're in the area. The inland saline lake is located in the Sonoran desert and is a remnant of prehistoric Lake Cahuilla. If you drive around the southeastern rim, you'll find bizarre volcanic domes, estimated to be 16,000 years old. 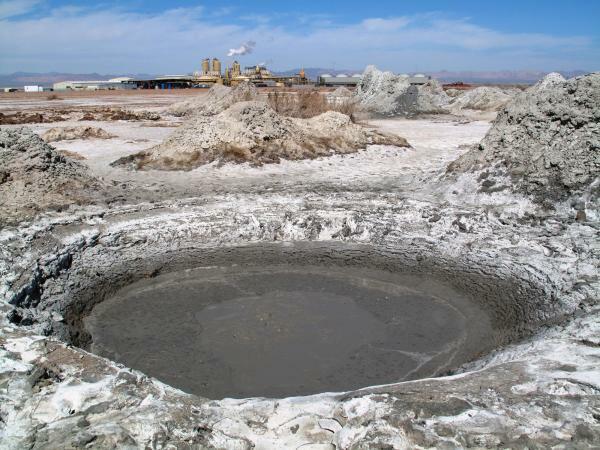 Then, there are the mud volcanoes, with liquefied mud that can reach staggering heat levels. The vents spew mud intermittently and they average from ground level to 8 feet, with vent openings ranging from 1/2-inch to a foot in diameter. Bombay Beach: Located at the extreme southern end of the Salton Sea Recreation Area, you'll find the town of Bombay Beach. While it is closed, it still attracts a lot of attention from photographers. It was once a spot where beach camping was possible, but today, it's just an abandoned town with some remaining structures that make for pretty dramatic photographs. Imperial Sand Dunes: Located 20 miles west of Yuma, the Imperial Sand Dunes are truly impressive to see for yourself. They have been the site of countless movies over the years, including Star Wars: Return of the Jedi. They can reach 300 feet high and you can rent an ATV or another off-road vehicle to explore them firsthand. You can even camp here with permits. There is conjecture that Slab City might be sold in the near future, meaning the entire premise of the area as the last free place in America will be no more. If a company buys up the land, they could potentially kick everyone out and re-purpose the land. Currently, it's rumored the residents have formed three groups to try to purchase the land, with one group already raising enough to purchase their one-third share, but the others are far from their intended goal. With the looming prospect that the State of California will eventually sell off all the land, now is the time to plan a trip to Slab City if you want to experience it for the truly unique attraction it is.